The MJ200C universal car audio cassette adapter is simple way to transform your old car stereo cassette player. This cassette adapter allows you to play music from virtually any portable device that has a 3.5mm headphone jack. It even has an adjustable cable position to match the orientation of your cassette-slot. Time to push aside your old cassettes and start listening to some music from the 21st century! Tips and Tricks - Over time dust can build up on your cassette player’s heads, so we recommend running a car cassette cleaner through your cassette player on a yearly basis. This will insure you get the best possible connection between the car cassette adapter and your device. 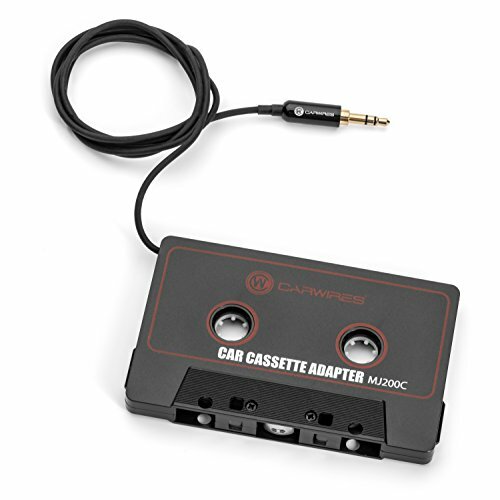 Some of today’s newer smartphones do not have a headphone jack, so you may need an additional adapter to connect this car cassette adapter to your device. For example, if you have an iPhone X you will need to purchase a Lightning to 3.5mm Headphone Jack Adapter. If you have any questions about this product by Carwires, contact us by completing and submitting the form below. If you are looking for a specif part number, please include it with your message.